A few posts back I did a quick comparison on Microsoft MOSS 2007 and IBM Lotus Connectins to see which one is best suited for Enterprise 2.0, for Corporate Social Networking. One of the criteria we've developed in our TeamPark approach at Sogeti is that the software needs to be S.O.C.I.A.L. In their review, Dogear Nation rightly pointed out that for instance Yammer, Facebook, Twitter and so on are missing. So where have the Garter researches been? 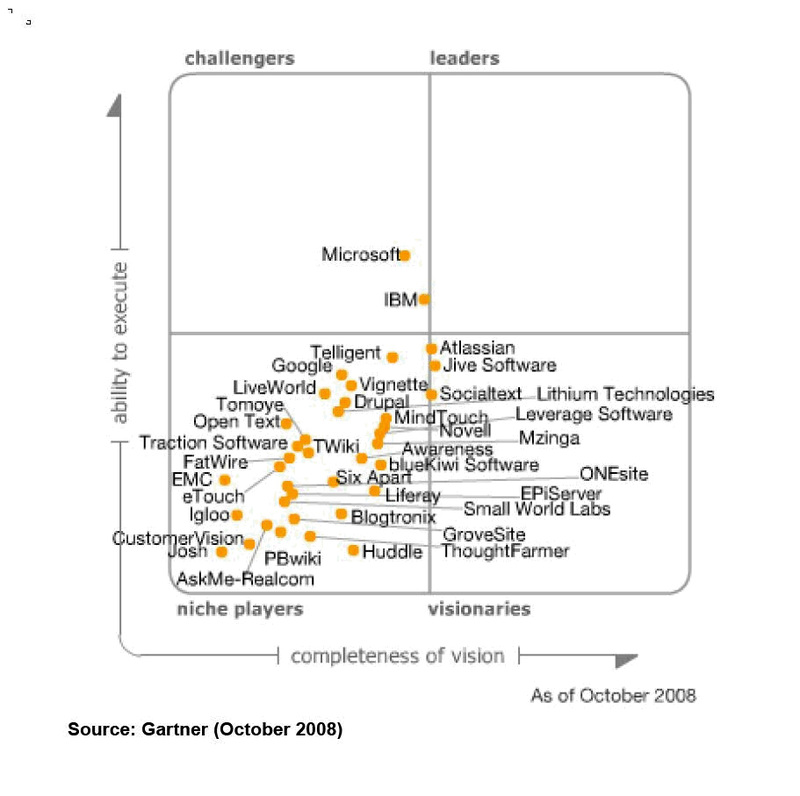 In the upper left quadrant we see both Microsoft and IBM named "challengers" with a great capacity to execute (read established corporate penetration), in the lower right quadrant we see a number of "visionaries" like Atlassian, Jive and Socialtext. The majority however falls into the lower left quadrant of "niche players" and no solution has made it to the magic quadrant yet. What does it take to get into the magic quadrant? 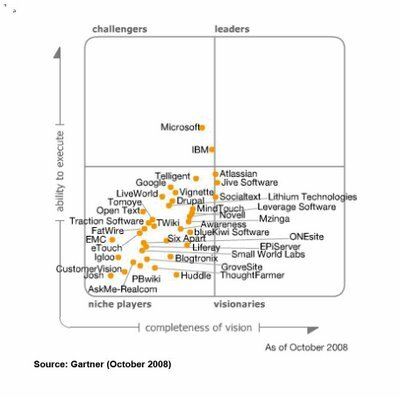 In blunt translation of the Gartner graph it should be Microsoft buying Atlassian for instance to combine 'completeness of vision' with 'the power to execute'. But that is not the correct answer. If we mix up Jive with IBM or Atlassian with Microsoft it does not create a winner, it will not be a magic quadrant recipe, because it will undoubtedly be a functional cocktail from a technical point of view, not from a social point of view. It will result in a (probably very good) platform which offers everything you would want, but in the end won't work. Probably we should rename 'www' to 'ppp' ;) .You could argue the terminology though, it could just as well be personal, social and professional. However, I think theseare the three domains to which we use the internet and with the current cloudcomputing trends this will create a new paradigm for identity management (IdM) and this will be the key in stepping inside the magic quadrant. In the 'old days' we had our home pc to facilitate our 'private need', meaning we used it to store our documents, photos and accessed the internet to find information for our hobbies. We also had a corporate pc on which we stored our work related documents. 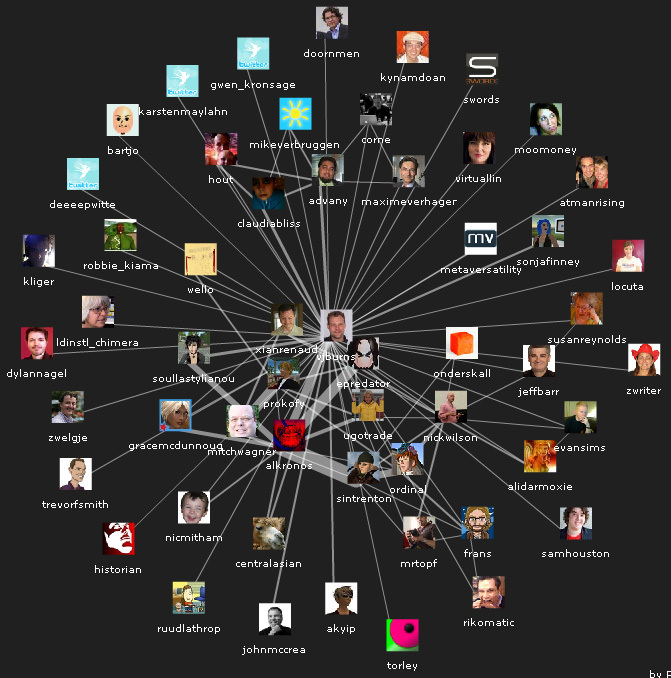 And in the Web 2.0 age we started to use the internet for social interaction. Each of these three domains is becoming more and more webbased and it confuses us, it frustrates us. We're constantly putting up content on a variety of sites, distributing our lives through various media to various audiences and we often find the content should move beyond the boundaries of just one domain and we end up duplicating the same information to another blog or wiki. The current trends on aggregation, the creation of lifestreams is convergence; pulling the content of various media into one single lifestream distributed to all our contact. Regarding the three domains however, we want - no, NEED - divergence; one single point of entry and the option to distribute it to different audiences, across the boundaries set by these domains. One of the functional prerequisites is the ability to organically group contacts (there are more ;)) regardless of the domain they are confined to. Suddenly a couple of new links to the MindBlizzard blog appeared on my Technorati Ranking, which off course I don't mind at all. First of this set of links was Who's The Biggest? Redux by the Second Effects blog who compiled a list of the Top 100 blogs on Second Life. No surprise I found myself somewhere down the middle, just one spot below "Ambling in Second Life" by my good chum Aleister Kronos, who's at number 61. That was some comfort... or not? A number of these blogs have been out of order off late. To see a list of who's no longer blogging anymore read this blogpost from November last year in which I list some of the blogs which haven't been updated in a while. Most notably the 3PointD blog, the once leading Second Life blog which has produced absolutely zits in the past year and a half and still neatly ranks number 52. We all know that Technorati ratings are a wee bit iffy at times. A lot of people noted this and ArminasX has just updated the blogroll. In this second version the MindBlizzard blog dropped to spot 82. I can't say this is an error, as I must admit I have not been blogging on Second Life much off late. As said, MindBlizzard and Ambling were on the 61 and 61 slots in the first version, Ambling now dropped to 88, which is also quite amazing since it hasn't had a single blogpost in over three months. So despite the tweaking, the list will probably never be perfect. We can work out intricated queries, tweak and reasses the quantitative rankings of the blogroll, but there is no way we can measure value, or quality in these blogs. I myself have not blogged Second Life as there was nothing special to blog from my point of view, no new companies entering Second Life, but I could have blogged myself to death in spotting every new inworld fashion designer, which just isn't my thing. A second link I'd like to mention comes from the notorious GoFugYourSL which produced A Dandy List of SL Blogs, an alternative blogroll, without judgement or ranking, just alphabetically sorted. Advertising is using sponsored commercial messages to build a brand and laying to locate these messages where they will be observed by potential customers performing other activities; these messages describe a product or service, its price or fundamental attributes, where it can be found, its explicit advantages, or the implicit benefits from its use. Read the rest of this very interesting article at TechCrunch. Although it's been around a while already, suddenly Microblogging service Twitter, is the talk of the town, overly hyped and going supernova with unsurpassed growth rates over 1300%. For those unaware of Twitter: It's nothing special. It lets you type 140 character messages to the world, or anyone who cares to read your digital farts. Nonetheless, Twitter is getting more and more popular and getting a lot of mainstream attention as twitterers like @BreakingNewsOn often bring breaking news way ahead of traditional media. In its wake we've seen all sorts of people turning to twitter to get attention. When I say all sorts of groups, I really mean all sorts of groups. On the serious side we find (of course) Obama, the Governator, Dutch Royalty and Dutch politicians (find the list on kamertweets.nl) for instance, and on the other side of the spectrum we find a list of pornstars who'd like more than 100 character lines in movies. Over the past months I've also seen an invasion marketeers on Twitter. Most of Twitter's richness though comes from add-on applications that allow you to search on certain topics and handle multiple streams. Due to its nature of 140 characters max per textmessage, people are often too honest, to blunt in their statements about almost anything and the number of stories about people who got into professional trouble after their boss picked up a tweet is growing. 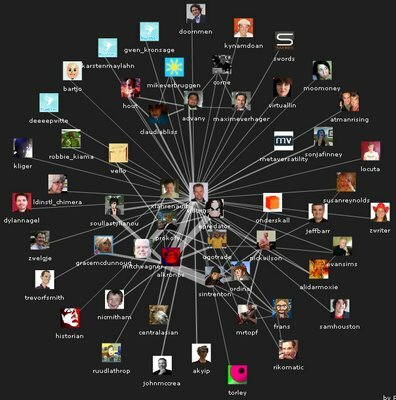 Online Marketing and CRM company Salesforce now adds to this, in offering a new service which helps companies to spy on Twitter. Your Customers Are Talking in the Cloud.Where do customers go for service today? More and more often, it's not the call center. What used to be everyone’s favorite way to access customer service has become a jumbled mess of touch-tone navigation and poorly trained outsourced agents. It's no wonder customers are looking elsewhere. Today, real wisdom lives in the cloud. Web communities. Twitter. Facebook. Forums. Blogs. Google. The cloud is where customers are turning for service. This, of course, is the positive, official view on the Service Cloud offering, the more realistic version is that companies want to know what is said about their products and service, not to help you, but to do damage control if a customer has been 'too honest'. Of course, there are exceptions; official corporate representatives who are not on twitter to monitor comments on their company, but for the love of Twitter itself. These folks are usually very accessible and welcome comments about their companies. All around us, companies feel the need to go Social. As the web grows and companies see their employees blog and interact, share knowledge everywhere, suddenly we have to take Social Networking behind firewalls and create a corporate walled social garden. It's not that big of a surprise senior management sees merit in embracing social networking as communities are pretty loyal and dedicated. It would be nice if we could bind our employees so strongly and also use their creativity to get better. It's probably no surprise either that they just don't quite get the essence of social networking. In the end it is about information, about knowledge that is the company's main asset, isn't it? It's not in the functionality. The next thing your senior management will probably ask for is a thorough analyses of requirements and a turn up a full list of features. 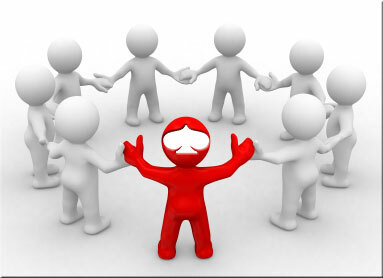 A Social Networking site should have blogs, wiki, forum, chat, and so on. Over the past month I've been doing just that and made a thorough comparison between Microsoft MOSS 2007, IBM Lotus Connections and Telligent Community Server. Drawing up comparison charts, listing the functionality is a cumbersome job. Especially when the result is that there hardly is a difference. All platforms offer more or less the same functionality. They're all the same, or not? When it's all about the same, the obvious choice for senior management is to stick to what they know and we already use inside the company. From this reasoning, many companies will probably go for Microsoft MOSS 2007 (or MOSS 14 if they can wait until 2010) as it will offer the basic functionality you would want and integrates well with the other corporate software, and even allows you to keep sharing those all important documents. It's like playing in a rockband. inarockband.com builds on the analogy that working for Sogeti is like playing in a rock band. Just as rock musicians we are serious about our passion, instruments and customers. In our creative work we understand that everyone in the project plays and important role, just as every instrument counts. Working with Sogeti is not about working your career, but about your passion. Be passionate about your work, try to excell and in excellence delight the crowd. In my opinion, Corporate Social Networking also fits this analogy. Blogs are a stage to enthuce and delight, communities a place to share passion. When we look at platforms to support this we are looking for simplicity, easy to use software instead of massively complicated configurable packages. The most suitable software for the job is Social, Organic, Collectively Intelligent, Alive and Linked. We at Sogeti are passionate about our job. We like to excell. Small wonder we are constantly working up new books on best practises, creating new standards and methods. One of the latest books we've come up with is about moving from Crowd to Community. The second part of the book deals with the Teampark idea, a method to implement and adopt social software inside companies. In the next release this part will be extended and worked out into a full approach. 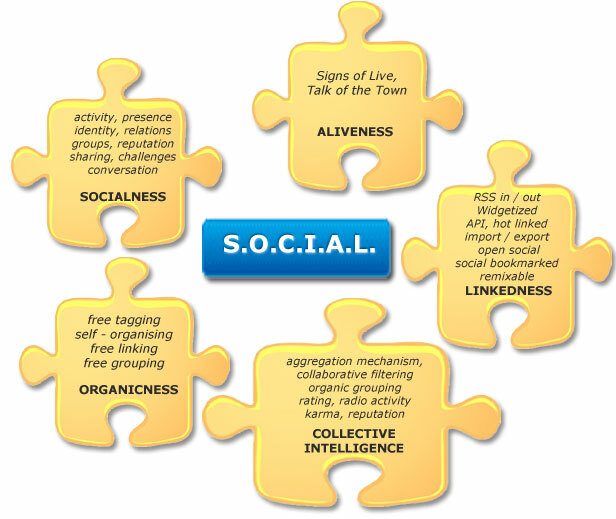 These are the key elements for Social Software. From this vantage point, there is a clear winner when it comes to Enterprise platforms: IBM Lotus Connections. Whereas MOSS will excell in sharing explicit knowledge, LC will tap into the implicit knowlegde of your workforce. While both vendors showed their products could integrate with existing e-mail systems (especially e-mail systems that they sell, such as Notes and Exchange), IBM’s Lotus Connections looked, at minimum, a year or more ahead of SharePoint in its social computing capabilities out of the box. It was a lot prettier looking, too. If we look at the road ahead, this conclusion still stands with Lotus Connections 2.5 going into Beta in April and expected to go Gold by Mid July whereas Microsoft MOSS 14 is due for early 2010. However, it is more than just release dates. It is about the core focus of the product. In terms of S.O.CI.A.L aspects, LC2.5 still has a more informal, organic, people centered approach than MOSS 14, which (from what I have seen under NDA) still is more formal and hyrarchical focussed on information, despite all it's slick tricks. Identifying the right triggers to create Social Networks is not a guarantee for instant succes though. On the one hand, setting psychology loose on Social Webdesign to delight the crowd and direct communities, creating emergent behaviour is tricky, but on the other hand we have the issue of the walled gardens. Companies will try to contain these platforms behind their corporate firewalls. About a year ago I did a project in wich security played an important role. The client went into extremes to protect its data. However, all it's corporate knowledge, its value, could be found on Wikipedia for free. Knowledge and creativity are hard things to contain, they will find a way. Take blogging for instance. From a bloggers point of view, his main drive will probably be to build a reputation. Blogging is more than just jotting down short things you are passionate about. You want to excell and gain authority. A global audience will probably suit you better than a limited corporate stage can offer. Regarding this, Hutch Carpenter wrote an interesting article on his blog "I'm not actually a Geek" where he asks how much scale is actually needed in Enterprise 2.0 Employee Adoption. The article raises many interesting issues, but the question remains if we should take it all behind walls. It is quite true that Blogs do not require a large scale adoption, It will take justa few catalysts to start interesting corporate blogs, but if you want your employees to excell, to put effort into this Social Environment you have to offer them a worldwide stage. Have them interact with the world instead of limiting them to peers. From a knowledge point of view we really have to consider which information really is actually a corporate asset. Is it knowledge on technology (which probably is out there on the web anyway) or is it about privacy, personal data and sensitive information about competitors or clients? When you carefully look around in your company you might find these catalysts; passionate people who engage and delight the crowd. These thoughtleaders and visionaries inside your company probably have their own blogs, as they will be sharing their passion, having a global stage to build their reputation. Do we really want to confine them inside corporate walled gardens? Will they combine the pursuit of their personal passion and delight the corporate crowd? You will undoubtedly find out they will put more effort in personal blogging than in corporate blogging if we rigidly put our Corporate Social Network behind firewalls. The current Social Networking trends focus on aggregation, pulling together updates from a variety of media into a single lifestream. If I look at my Plaxo Pulse stream for instance puts my twitter messages and my blogposts into a single update stream which is visible for all my connections. The next challenge will be to move from this information convergence to information divergence. This divergence will allow me, as a blogger, to write one passionate article and distribute it to the medium I chose and the audience I choose. This divergence will even more require personal and professional digital presence to blend, calling for better identity management and privacy measurements. In short, getting into the Magic Quadrant of Corporate Social Networking will not be about more features, but about smart blending of corporate and private digital identities. As the social web continues to grow, and more and more people are filling in their personal details everywhere, it is no wonder specific social search engines start to pop up, which can actually turn up all kinds of embarrassing and potentially invasive information about you. We all see it happen, but sofar I have not seen any serious attempt at redesigning the identity management and privacy issues on the web. It will take years untill we will figure out how to tackle this problem as it will probably take a full redesign of the entire internet architecture at base level. For now, you have to take charge of your online identity. Tips and tricks on how to regain some control can be found at PC World, The San Francisco Chronicle and The Electronic Frontier Foundation. Over the past month I have been doing a Proof of Concept to see which Enterprise software would offer the most social value. The main focus was on the differences between IBM's Lotus Connections 2.5 (going into Beta in a few weeks) and Microsoft MOSS. At our offices in the Netherlands we have a version of MOSS 2007 running, but apparantly we were not using it to its full extend, so Microsoft felt we were not giving them a fair chance and they did a full proof of concept at our offices in Paris. I must say, I was a bit surprised. Microsoft Moss (Sharepoint) is actually better than I had thought. We also received a preview of the upcoming MOSS14 release, which should head into Beta later this year and will probably arrive early 2010. Without going into specifics, it won't be a surprise that Microsoft will continue the trends they set with Office 2007, using contextual ribbon menu's and throw in a lot of Silverlight. Of course, there will be more focus on social networking. One of the features Microsoft included in the presentation was an external kit, the Podcasting Kit for Sharepoint (PKS) by Codeplex. This kit went into beta last month and also heavily leans on the Silverlight technology. PKS can also be added to the current Sharepoint version of course. Yesterday I came across an interesting article on the "I'm not a Geek" blog on social networking inside companies, or Enterprise 2.0. In this article Hutch Carpenter asks how much scale is needed in Enterprise 2.0 employee adoption. found a movie about 3Di OpenViewer 1.0 beta on youtube. "3Di OpenViewer" runs on IE as activeX compnents and enables you to view SecondLife or OpenSIM on web browser. I find "chat", "sit", "touch" commands on the right side of the viewer. One interesting thing is avatar control. You know, in second life we move avatars by keyboards, but on 3Di OpenViewer you can move your avatar by mouse. I guess it's helpful especially for beginners. This corresponds with an article in the Dutch techmagazine Emerce, which featured an article which stated that iPhone users generally use 30 to 40 times more datatraffic than other mobile web users.